which is the first site I ever made a Clickbank sale on. As you could see I have lots of reports here I get like resell rights reports and stuff like that and I had an order form. This is how it looked back in the year 2000, when I made my first Clickbank sale. That took a while I had to wait for search engine rankings and traffic. We’re gonna show you how to do it a lot quicker. Here’s what you want to do. Click the button right and see if the domain is available. 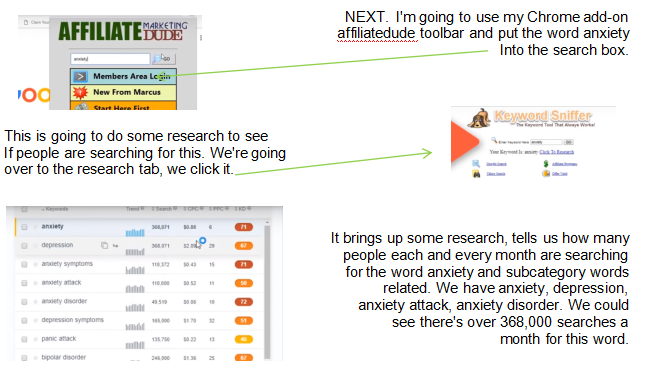 We could do something like anxietyfreeguide.com and see if it is available. It looks like it is available. Then we complete this form to get web hosting. That way I have my site at anxietyfreeguide.com. What I need to do is create something of value known as a lead magnet or bait. Like this now, we want to create a free anxiety guide. You can create by compiling from online, writing your own or you can actually go to getwebsitecontent.com and order someone to write an article for you. Now you want to make it really juicy. You want to do is search and find out what these people are struggling with. The way you can do this is simply by going to google and searching for anxiety forum. You can look at anxiety forums and you could see what people are struggling with. Physical symptoms, we got panic attack and anxiety ruining my life, health, anxiety, severe anxiety. So we could write a guide on how to deal with all this stuff. If you’re in a medical type market make sure you get a good disclaimer. If you don’t know how to get a good disclaimer do something else, don’t mess around with this stuff. What you want to do is you want to get an overview of what these people are struggling with. You make your guide. The guide is what’s known as your hook or lead magnet. why do we call it a lead magnet? 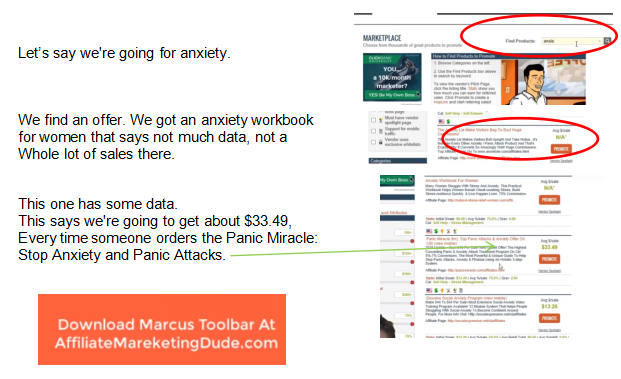 I’m glad you asked the reason we call it a lead magnet it’s because I want to drive people back to my site, That are struggling with anxiety to a page like this a very simple WordPress. A page that’s hosted on my site. Look at the search volume and the forums; find out what your markets interested in. SUPER EASY! Make your page get a picture of a guy freaking out about anxiety. Give them the free book, put your name and email for the free book. This isn’t using some crazy lead pages or click funnels. This is a basic WordPress site using one of my plugins that you can use to create as many landing pages, squeeze pages, funnel pages as you want. What you want to do next is important. First of all, you get them in there, you create your bait. Your opt-in page is like a brick wall. These people are going to come in here they’re going to be like, “Man, I sure do want that anxiety book.” because you baited them, the fish is here. But they hit the brick wall which means they have to put their name and email. 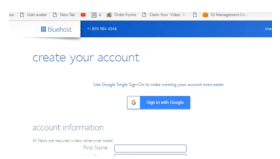 Go to the next step now, once they give the name in the email in the box they go on to your database which means you got all these people down here. You can follow up with them. You could get them into all kinds of different things. You can email them, you could put them on an automatic drip feed of emails to help them with anxiety. Magic happens after they put their name and email in the box. What you’re going to do is..
You’re going to get some emails, check your email. You just got the book delivered to you but for right now check out these top three anxiety guides that I have found for you. 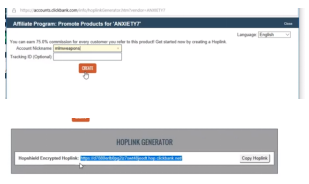 That’s where you put your affiliate links for the Clickbank guides. You’re going to make a little page, hit promote, get the link. you just put in your code and this is your link. You are going to have this link on there and when they click the link to get one of these three guides you’re going to get paid. So it says here’s… Hey do you like my tips? Get my free anxiety guide here. So every time I’m answering a question, helping people out, they’re going back to my page. To get the bait, to fill out the form, to go on my list to see those three things, that’s going to make me money. You could do this right now because on forums people are searching, waiting for your information, waiting for your help. You can get in front of them. Another thing you can do, Is you could check out Facebook groups, you can be helpful in Facebook groups, whether they’re talking about marketing, talking about anxiety, relationships and dating. The sky is the limit. Create helpful content. The cool thing is once you have your guide written or your helpful lead magnet bait written, you can actually use this anywhere. Because people are going to like what you have to say and they’re going to come back to you for more info and all you got to do is post little answers and questions and make money. If you don’t try, you’re not going to get any results. So you might as well follow what’s been working for me for the last 19 years. I know what works from the very first day and this is something that can happen quickly. If you want a bonus tip you can also send pay-per-click traffic to your lead magnet bait page and get people that way. 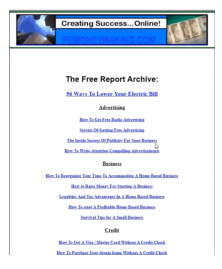 You want to make money fast then follow this guide subscribe at MARCUSMENTOR.ME, Where I have all the tools for you, Including the plugins that make this work. Tools on how to get started, Tips on how to set up your page. Everything you need to get started. It’s super cheap and we send you an affiliate dude t-shirt and a copy of my brand new book, Affiliate Marketing Is Not That Big A Deal I Sit At Home And Drive Ads To Little Sites That I Built.